The service is sponsored by the Helvetas Swiss Intercooperation and carried out by the Centre of Rural Economy Development (CRED). Refined models will be used to develop tourism development in the locality. A cloudy morning, while the leaves in the garden are still wet from the mist and roosters crow, the morning sun brightens terraced rice fields and mountains surrounding Suoi Thau Village. Sixty-five-year-old Giang Thi May gets up to begin her day’s work. Today she has more things to do than normal as her family is hosting a group of tourists from Hanoi. She hurries to chop up dried bamboo branches to make a fire to prepare warm water for the guests. Her son, Dang Van Nam, said he was given a loan of VND80 million (US$3,560) from the project for five years at a lower rate than banks. “I upgraded my house, built more toilets and bathrooms and bought necessary stuff, like mattresses, blankets and mosquito nets,” he said. They are the two first households in Suoi Thau 2 Village, Ban Luoc Commune, Hoang Su Phi District in the northern province of Ha Giang doing experimental homestay service. This is part of a project titled “Improving the Livelihood of Ethnic Minorities through Community-Based Tourism” sponsored by Helvetas Swiss Intercooperation, a development organisation, and carried out by the Centre for Rural Economy Development (CRED). The project has been implemented in four communes of Thong Nguyen, Nam Son, Ho Thau and Ban Luoc in Hoang Su Phi, and the two communes in Quang Yen and Trung Khanh districts in Cao Bang Province. With a total area of nearly 630 sq.km, most of which is high mountains, Hoang Su Phi has the most spectacular terraced fields in the north. They have been created by 12 minority groups with distinctive cultures, including the Nung, Dao, Mong, La Chi, and Tay. Plassat Nicolas Paul, also from France was impressed with the ancient customs preserved by locals. “I also highly appreciate their belief in holy gods,” he said. 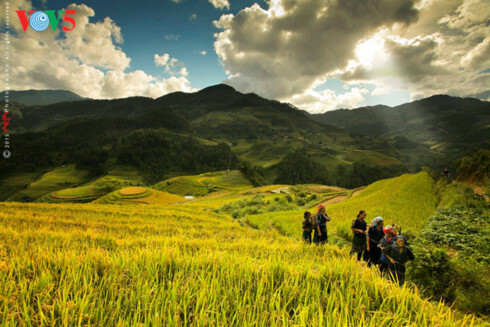 “We chose the destinations because they were supported in CRED’s previous agriculture projects and also because they are located on tourism routes linking Lao Cai and Ha Giang provinces, and the rich of cultural identities with stunning landscape confirms the huge potential for tourism,” said Cao Dai Hung, manager of the project. The project organized field trips to other localities for locals to understand the operation of home-stay. It organized cooking classes for them, offered English classes to children and encouraged the villagers to offer more tourism products, such as traditional weaving, dancing and singing. In one year, the project has established 11 home-stays ready to receive tourists, and two others on the way, various tour routes, with 500 locals trained in community-based tourism. So far, more than 700 people have directly benefited from the project while another 2,000 others have received indirect social benefits. The homestays have received more than 3,200 tourists, of whom more than 630 were foreigners. “Besides traditional tourism services, such as tour guides, accommodation, transportation and performances, CRED intends to develop new tourism products to enrich tourists’ experience and encourage them to stay longer, such as tea processing and rice farming,” Hung said. He added that though the current income from tourism at the sites was not high due to few tourist arrivals, those offering the service have benefited, encouraging them to continue. CRED has examined trekking and biking routes in the region as well as setting up handicraft villages for visitors. “In the next few months, we will host more mountain biking events, where participants may join voluntary works for local communities and promote the tours to more travel agencies in and outside Vietnam,” Hung said. The homestay model will then be applied to more families in the district. Hoang Su Phi’s authorities have coordinated with Helvetas and CRED to compile a plan for promoting tourism to 2021 with a vision towards 2030. At present, the district receives about 12,000 tourists a year and expects this to rise by 30% thanks to the homestay models and community-based development project. The district plans to receive 110,000 tourists in 2021, of whom 23,000 will be domestic and 87,000 foreigners. The yearly growth of numbers in 2017-2021 is 25% for foreign tourists, and 28% for domestic guests. Key potential tourists to the locality come from Europe, Australia and north America, who are interested in experiencing distinctive cultures, ecological tourism and risky sports. Chung said authorities had encouraged communities to offer home-stay services with their real identities, high awareness of protecting the environment and developing household economies. “By following these guidelines, we hope to avoid failed home-stay models in other places,” he said. The province plans to create 1,700 jobs from tourism in the next five years, helping to eradicate poverty.